Microsoft has been gradually changing its privacy settings in Windows 10 with the Fall Creators Update to give its users more controls over their data. In April, Microsoft addressed some initial privacy concerns in the Windows 10 Creators Update with simplified data collection levels—Security, Basic, Enhanced, and Full—and eventually revealed its data collection practices. Now, the software giant is making another privacy-related change with the upcoming Windows 10 Fall Creators Update, which is due for release in October 2017, giving you much more control over what apps can do with your device. Just like apps on your smartphone's app store, apps on Windows Store also require permission to access your computer's critical functionalities like camera, microphone, calendar, contacts, and music, pictures and video libraries. While Android and iOS allow you to limit an app's permissions to access these sensitive things, these permissions have currently been provided to all apps implicitly in the Fall Creators Update, except for access to location data that needs an explicit user permit. But that's going to be changed. 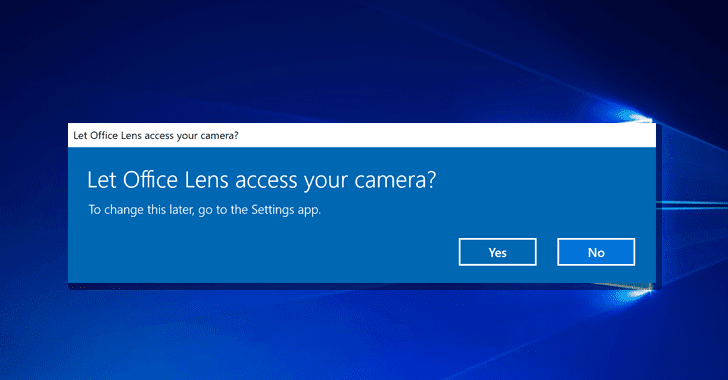 For each new app installed on the Windows 10 Fall Creators Update, the operating system will prompt users for access to their device's camera, microphone, contacts, calendar, and images and other information, requiring an explicit opt-in for each app. "Starting with the Fall Creators Update, we’re extending this experience to other device capabilities for apps you install through the Windows Store," Microsoft wrote in a post detailing the privacy improvements. "You will be prompted to provide permission before an app can access key device capabilities or information such as your camera, microphone, contacts, and calendar, among others. This way you can choose which apps can access information from specific features on your device." However, when users install the Fall Creators Update, existing applications on their device will retain their permissions, but new apps installed from the official Windows Store will require their access to be enabled explicitly. In order to review and manage your existing app permissions, head on to Start → Settings → Privacy. To learn more about Windows app permissions, head on to this link. Microsoft is set to test these privacy changes with Windows Insiders shortly. The Windows 10 Fall Creators Update will be released on October 17th.